We're already in March and the AAF regular season is already about a third of the way over. As teams around the Alliance take more definitive shape, more players are either starting to stand out -- or are on the verge of breaking out. Since highlighting players who couldn't quite make it in the NFL is what this league is all about, it's always good to know which players are making a name for themselves. Each week, I'll lay out five names you should know for the upcoming games. These are names who are usually coming off of big performances, or could be key matchup players for their games ahead -- especially if there are any fantasy football implications. I'll also try to give you a heads up on players who are generating some NFL buzz; that list will fill out a bit more as we get further into the season. 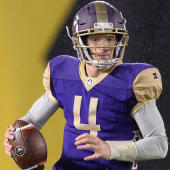 With that said, here are five names to watch for in Week 4 in the AAF. It's been an incredible, if not unexpected, week of talking up Mettenberger after he threw two impressive touchdown passes coming off the bench last week against the Apollos. Now, he has to keep that going against the San Diego Fleet defense, which is second in the AAF in points allowed. Mettenberger's surprising performance puts his situation into some perspective. He was clearly an upgrade from Christian Hackenberg, who, bless his heart, has had a tough go of it for some time. That begs the question why Mettenberger wasn't starting from Week 1, when it was evident then Hackenberg couldn't get it done. That can be a bit of a mystery even after the switch was made. Some players are better on Sundays (or, in this case, Saturdays) than Wednesdays. He also hadn't played as recently has Hackenberg -- although, you can call that a wash since Mettenberger actually had starting experience in the NFL. In any case, it's not uncommon for a player who was under far less pressure (Mettenberger in this case) to outperform the initial starter. Can he do it again, this time as the full-time starter? It'll be fascinating to see, because Mettenberger made the Express far more formidable. Mekale McKay is the leading receiver for the Commanders in both receptions and targets, but Ward isn't far behind with 10 catches for 101 yards. He hasn't scored a touchdown yet, but only because one was called back a week ago against the Fleet. Still, plenty of people around the organization were high on Ward coming out of training camp. He was a former quarterback at the University of Houston, but was too small to play the position in the pros. Still, he's athletic and capable of making the transition to wide receiver. He's even gotten some snaps in the punt return game. The Commanders are going up against a terrific Birmingham Iron defense that is not only first in the AAF with seven points allowed per game, but locks down in the red zone. The matchup between Ward and this pass defense alone is big, but on top of that, McKay has a lower leg injury and did not practice on Thursday. Ward may be the go-to guy for San Antonio's passing game in Week 4. In the Hotshots' 3-4 defense, Robinson plays a key role in both rushing the passer off of the edge and dropping back into coverage. He went to a small Division II program, Newberry, and although his measurables at the 2015 NFL Combine stood out, he was taken in the seventh round and bounced around with three teams -- he did start a few games for the Minnesota Vikings -- before finally signing with the Hotshots. He plays at about 265 pounds now -- up about 20 pounds from college -- and word is that he's starting to generate some buzz amongst visitors to Arizona's practices. Keep your eye on him as he comes off the edge against Atlanta's offensive line, and also in coverage against their tight ends and slot receivers. Your best chance to defeat Orlando is by controlling the clock and keeping the Apollos' offense off of the field. Memphis actually did a decent job of this a week ago and the Stallions are another team that's been described by one GM as one of the more physical ones in the AAF. Even though the offense employs a two-running back rotation with Bouagnon and Branden Oliver, Bouagnon is more the physical back and is getting his fair share of carries in the red zone. He also leads the team with 154 yards and two touchdowns. He never got a real look in the NFL and might be a tick too slow, but he's a dependable back that the Stallions might lean more heavily on moving forward. Spruce's stock is about to skyrocket. He's turning into a fantasy stud thanks to the quarterback switch to Philip Nelson, which has prompted the #Nelson2Nelson duo. Spruce was an absolute stud when he was at the University of Colorado, tying or breaking a whopping 43 school records during his career. But he didn't stand out at the NFL combine, wasn't drafted and wasn't able to stick with a team. That's changed with the Fleet. He caught two touchdown passes a week ago against the Commanders and is quickly becoming one of the more productive wideouts in the AAF -- which is a big deal because the league still has a problem with dropped passes. Meanwhile, Spruce is catching practically everything coming his way.